Birth Marks for some people, can cause them considerable difficulties and leave them distressed and self-conscious. Self-esteem and quality of life may also suffer. Vascular birthmarks are a distressingly common disfigurement. 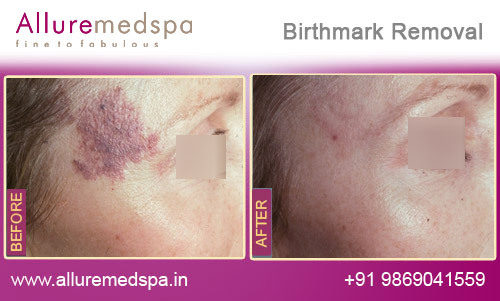 A birthmark (naevus flammeus) is a vascular pigmentation caused by both superficial and deep broken capillaries in the skin that show as a wine red skin discolouration. Distinguished from pigmented birthmarks by their red colour (caused by underlying blood flow), red vascular birthmarks are often called port wine stains. Pigmented birthmarks such “cafe-au-lait” brown spots are due to an increased number of pigment producing cells called melanocytes that reside deep with the skin (dermis). Stains that appear flat and pink in childhood may deepen to a deep red or purplish colour with some thickening of the skin or small lumps in adulthood. 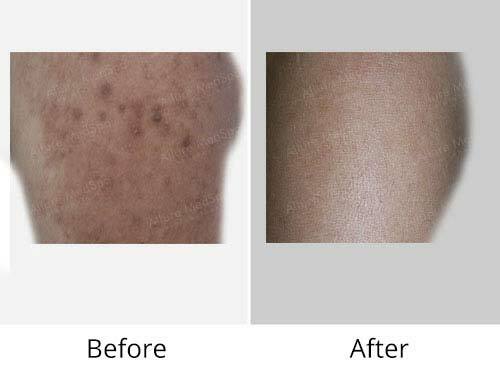 Laser treatment can remove most if not all the visual effects of birthmarks, port-wine stains, moles and pigmentation, increasing people’s self-esteem as their birthmarks are reduced. The laser light energy is finely focused on the birthmark, passing harmlessly through the translucent top layers of the skin to heat the underlying blood vessels that are causing the birthmark. When the laser light hits the red colour of the birthmark, the light is absorbed and its energy released as heat. The heat breaks, or cauterizes the small vessels under the skin, which atrophy leaving a lightened colouring. The treatment is non-invasive with virtually no recovery time necessary; you can resume your normal activities immediately after treatment although it is recommended that you avoid strenuous exercise for the first 24 hours. 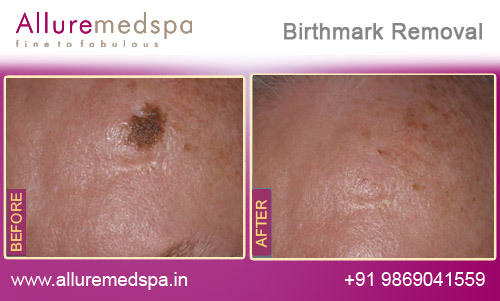 Laser treatment is simple and safe and can remove birthmark stains with virtually no scarring. Laser treatment destroys the vascular capillaries without any significant damage to the overlying skin. Every individual rightfully aspires to look good in a youthful and spotless way. At Allure MedSpa, we assimilate impeccable artistic vision and best technological breakthroughs in dermatology to enhance the natural exquisite beauty of your skin. There are many laser systems used to treat birthmarks. However, as important as the technology is the competence and experience of the medical professional operating the machine. No one laser is the answer for every problem or skin type. Expert dermatological diagnosis and correct assessment is vital. With its outstanding team of Dermatologists, Allure MedSpa helps you neutralize frown lines, wrinkles, scars and birth-marks in its state-of-the-art facilities at highly affordable, value for money prices. No wonder, patients from all over the world throng Allure MedSpa to achieve their cosmetic and skincare goals. 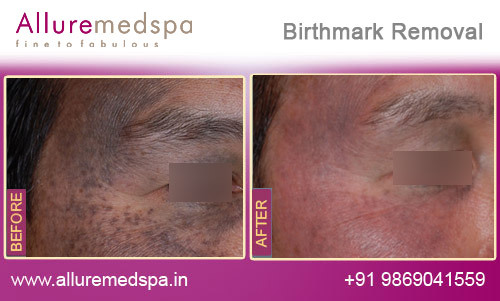 During laser birthmark reduction treatment some patients experience a slight stinging sensation, in the skin. No two birthmarks are the same. So it follows that no treatment plan for birthmark removal and skincare will be uniformly the same either. Your dermatologist will assess your mark and then recommend the best procedure tailor made for you. The heat produced by a reaction to the laser light may cause a bruise and / or swelling, which generally disappears within a few days. Apart from this, the treatment is painless, and the cooling “chill tip” on our laser equipment is normally all that is required reduce any discomfort to an acceptable level. Some patients choose to apply a numbing cream prior to treatment. Following the treatment, the pain is minimal to non-existent. As in any laser treatment, it is advisable not to expose treated part to the sun after treatment and avoid swimming or any activity that causes excessive seating. Treatment time is dependent on the size and extent of the birthmark but can range from a few minutes to an hour per session. Depending on the type of birthmark being treated, 4 to 10 treatments given at one monthly intervals are known to give the best results for reducing birthmarks. Allure MedSpa which is renowned for its state-of-the-art internationally acclaimed services,offers affordable and cost effective cosmetic contouring procedures. To know more about the cost of your procedure request a consult by filling the form below.Your consultation is your chance to ask questions about Skin treatments and put your mind at rest. Our cosmetologists will be there to offer full explanations and answers to all of your queries. 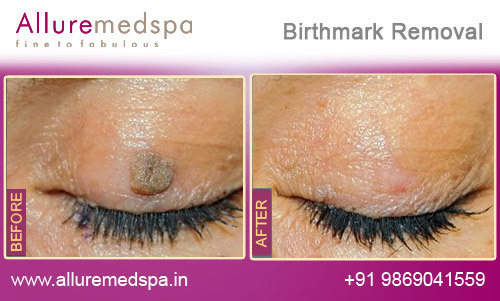 If any birth-mark has been constantly bothering you , you can go in for laser birthmark removal. Allure MedSpa’s clientele comprises of local, out-of-town patients. A good percentage of patients also ‘fly-in’ from out of the country to have surgery with our renowned cosmetologists. However, one must remember that cosmetic surgery is meant for improvement, not perfection. It is important to have realistic goals and expectations when considering birthmark removal. What does Birth mark removal cost? 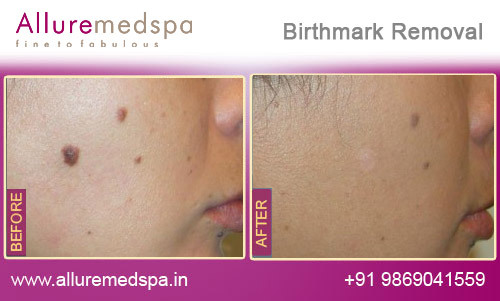 The cost of laser birth mark removal depends on how long it takes to carry out the procedure. This, in turn, depends on the surface area being treated. 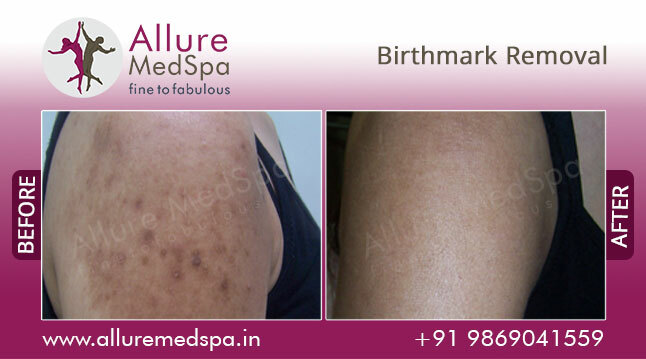 Call Allure medspa today on +91 9869041559 for further details on birth mark removal or ask us to call you back.